I have always been an advocate of self care, and before becoming a mum I dedicated most of my spare time to things which nourished me physically, emotionally and spiritually. I loved doing yoga, reading, experimenting with cooking, getting massages, going for big walks and sinking into warm baths. Since becoming a mum I have an even greater need for these self care rituals, despite the fact there is much less time available. I am the founder of Alyssum Alchemy a range of organic, luxury self care products which encourage people to take time out on a daily basis for themselves and am delighted to share my own tips on creating simple daily rituals for calmer, happier and healthier mummas. As mums it’s so important to create space in our day to honour our hard work. We never clock off as a parent, especially as a mum, but we can try to find moments of stillness or create special experiences which are simple yet which help to nourish us emotionally, physically or spiritually. We give so much of ourselves being a mother regardless of whether we work another job or we are a stay at home mum. There is always something else to be done, something else for us to focus our attention on, so we often neglect to take time out for ourselves to replenish our energy levels. But if we burn out (this can happen emotionally and energetically as well as physically) then we can’t give our best as a parent or a partner. Taking care of ourselves is a priority and simple daily rituals are a lovely practise to help keep us feeling emotionally balanced and keeps damaging stress hormones at bay. Aromatherapy is a very accessible self care tool to use for balancing our emotions and creating sacred space in our homes. The simple act of burning essential oils fills our home with beautiful aromas while enabling us to benefit from the therapeutic and mood balancing effects. The conscious act of filling the burner with water and adding a few drops of oils you’ve chosen can become a sacred daily ritual or a mindfulness practise as you breath in the scents and foster a positive mindset. Only purchase high quality 100% pure essential oils (not fragrance oils) and check for botanical names and used by dates to ensure they are genuine essential oils. The following blends are lovely in the home and can help to create an uplifting atmosphere and keep our nerves calm. Using high quality aromatherapy products during your day (such as skincare, shower and bath products or room and body mists) are another simple way to take a few moments out from our day. When we engage our senses we bring our focus to the present moment and away from the list of chores, the dinner preparations and the pile of bills we haven’t paid and we get to benefit from the beautiful aromas and mood enhancing effects. Ritual can be as simple as lighting a stick of incense or making delicious food and sharing it with someone you love. It can be having a bath with luxurious products, or drinking your morning cup of tea. It can be dabbing on your favourite scent or nourishing your skin with decadent and delicious skin care. Playing music, meditating, practising yoga, being creative, painting your nails or spending time in nature can all become simple rituals dedicated to creating time for self love and compassion enabling us to rest and renew our energy. Ritual is about being in the moment and celebrating something sacred. You and Now. If you don’t already have one, consider creating a special space for your rituals. It might be on your dressing table, desk or living room. 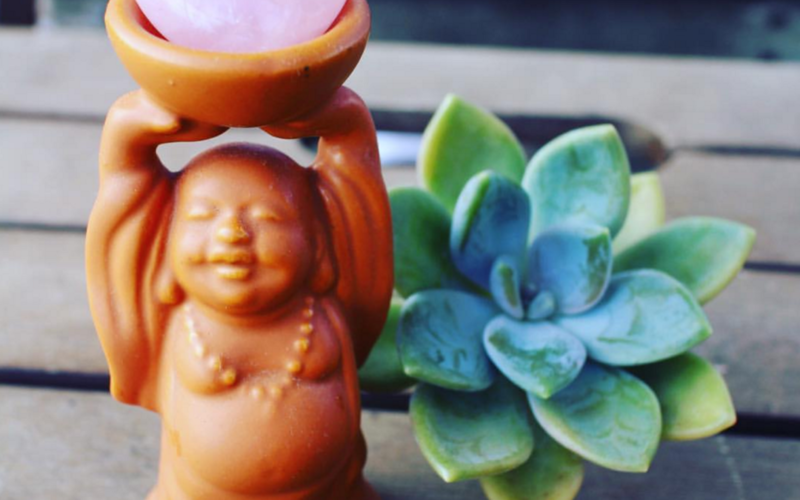 You might like to dedicate a small bowl or surface to your crystals or favourite pampering products, perhaps add a vase of fresh flowers or a potted plant, an oil burner, candles or incense. Add to you sacred space whatever makes you smile. Pretty buttons or lace, beautiful found objects such as feathers and shells. Perhaps you have inspiring quotes or beautiful pictures which help you to feel positive and motivated. Let this space grow and evolve, let it represent you, your hopes and dreams and your immense value to your family and loved ones. 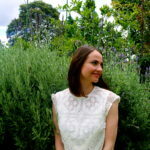 Alison Gallagher is an intuitive healer, aromatherapy alchemist, meditation teacher and founder of Alyssum Alchemy. She lives in Sydney, Australia with her husband Michael and 1 year old son Flynn. She loves yoga and cooking, indulging in sacred self-care rituals and sipping tea in vintage china. To explore the full Alyssum Alchemy collection visit www.alyssumalchemy.com.au where you can subscribe to Alyssum Alchemy newsletter for inspiring self-care rituals and full moon updates.